The DVCC Varsity girls grabbed the first place finish in the Tempe City Meet Championship with 33 points! Haley Wolf (19:20) was the 1st place finisher, followed by Katy Clausen (21:12) in 4th place, Laurel Froelich (21:23) in 6th place, Allison Estrada (21:34) in 9th place and Soraya Holley (21:41) in 13th place. Only seconds behind Soraya were Maddy Shoemaker (21:45) and Quinn Boardman (22:02). Excellent performance ladies! The Open race was dominated by DVCC girls with a perfect score of 15 points! Our runners swept the first seven places followed by nine through eleven too! Sarah Crall was the first place finisher with a time of 22:22 followed by Sydni Nedza in second at 22:44, Kyra Mazanec in third at 23:04, Julia Nelson at 23:38 in fourth and Emma Janas at 23:39 in fifth place. This was an awesome race for all 23 runners dominating the competition! The Freshman girls won their race with 41 points led by Hannah Garcia (23:28), Lia Rao (27:49), Annika Beck (28:25), Steeley Beringer (29:13) and Rylee Reginald (29:13). This was the first time these girls competed on the course and they held their own! Great job girls! 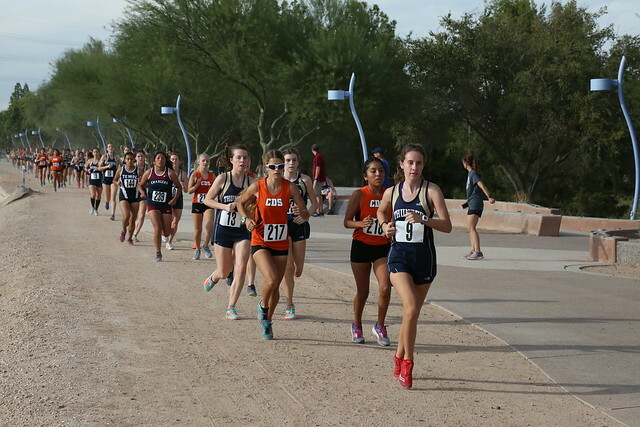 Come cheer for the girls at the Regional Championship Meet at Crossroads Park in Gilbert on October 27th!